With Election Day 2016 a little over two months away, many political analysts are projecting Democrats to gain seats in both the House and Senate. But winning the 30 seats they need to wrest control of the House from the Republicans is generally seen as a longer shot than the four or five Senate seats they’d need to lead that chamber (depending on whether or not Hillary Clinton is elected president and Tim Kaine, as vice president and president of the Senate, has a tie-breaking vote). One of the biggest obstacles to large swings from one party to the other is that so few incumbents lose their re-election bids. 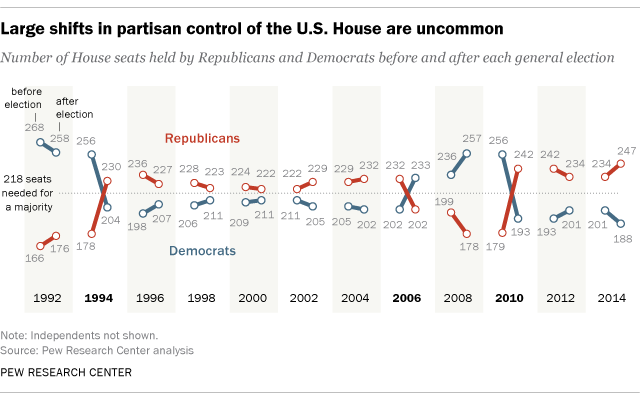 On average since 1992, 93% of House members who actually seek re-election have won. Even in 2010, the re-election rate fell to “only” 85%, with 338 of the 396 representatives running for re-election retaining their seats.